Happy birthday to one of the very first -- and still one of the best -- online casinos! 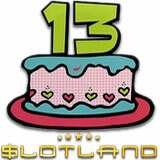 This month Slotland.com, one of the world’s most trusted online casinos and home of some very popular no download slots, celebrates its 13th birthday. Slotland's dedication to keeping players happy has set the standard for the entire online casino industry. At the end of the month a random draw will award $8500 in bonuses to 50 players that have deposited between October 11th and 30th. The top prize winner will receive $2000. $50 no-deposit bonuses for current and new players and up to 100% Birthday Builder match bonuses keep the birthday party going this week. Next week there’ll be 50% match bonuses during Birthday Happy Hours Friday and Saturday evenings. Slotland’s progressive jackpot is currently over $150,000 and hasn’t been hit since June. Since it’s usually won before it gets that high, and seldom goes more than six weeks without a major win, Hilary could very well get his birthday wish. The last big jackpot win was on the Witch’s Brew slot machine but since all slots games are tied to one jackpot the next winner could be playing any of Slotland’s 22 one-of-a-kind games. Slotland is a no download casino. None of its instant-play casino games can be found at any other online casino but six can also be found at Slotland’s mobile casino. Congratulations, Slotland!!! Those four years that I have been with you does not seem to be long, haha!